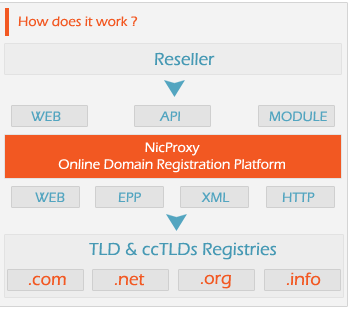 NicProxy offer a turnkey reseller automation platforms for a large number of gTLDs and ccTLDs making it easy for you to manage all your domain names through a single provider. NicProxy Web Interface and API tools are scalable to your needs. Whether a small or large Partner with 50 or 1,000 plus domain names and services, NicProxy can support your growth. The NicProxy API (Application Program Interface) is designed for Resellers who typically register large volumes of domains per year, and have adequate technical resources to manage an easy integration process. This is our most robust solution available if you are serious about providing the Web identity products to your customers.